1. Remove any stems from the pods, then shell the peas, reserving the pods. Reserve 100g of the shelled peas and save any extra to use in another recipe. Melt the butter in a saucepan and add the onion, leek, celery and salt. Cook gently for 8-10 minutes. Chop the pea pods and stir into the onion mixture. Cook for 10 minutes more, stirring often. 2. Add the potato, sugar, 100g shelled peas and 1.25 litres of water. Bring to the boil, then partially cover and simmer for 20 minutes, adding the lettuce in the final 2 minutes. 3. Remove from the heat. Add the cream and a little black pepper, then stir in the milk. Purée in batches until smooth. Push through a fine sieve into a bowl (don’t skip this step), discarding any fibres, and allow to cool. Once cold, chill in the fridge for a few hours. 4. While the soup is chilling, whizz the basil, garlic and olive oil in a food processor with a pinch of salt to make a green liquor. Set aside. 5. Remove the soup from the fridge and thin with a little milk if necessary. 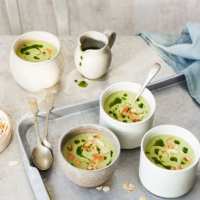 Season if needed – cold soups need more robust seasoning than hot ones. Ladle into bowls and add a few dots of the green basil oil to each one. Finish with a sprinkle of toasted almonds. Any leftover basil oil can be splashed over vegetables or stirred through pasta with parmesan.